Yes, it is the male seahorse that gets pregnant! the male seahorse has a brood pouch in on its ventral surface into which the female lays hundreds of eggs. the male then fertilizes them and carries them inside the pouch till the eggs develop into baby seahorses. 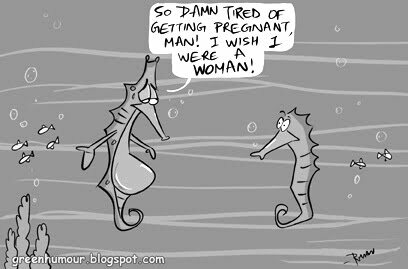 I know so many women who'd pay a fortune willingly to get a husband as dedicated as the male sea horse! haha..this is news to me! thts a new thing to knw....thnks fr sharing...!! !